Perforated hollow viscous is a life threatening cause of abdominal pain and carries a mortality of 30-50%. 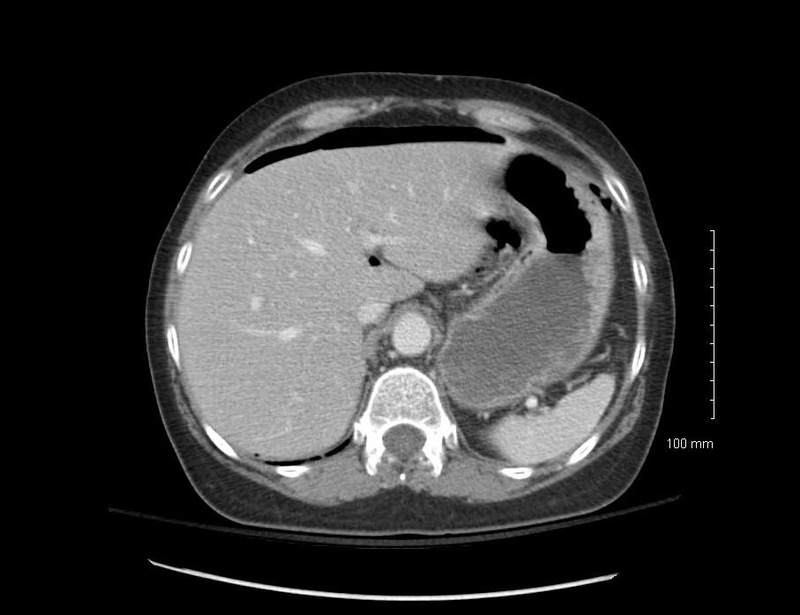 This diagnosis is first suspected on clinical grounds in ill patients with abdominal pain. Rapid treatment, resuscitation and surgical consultation should be initiated when the diagnosis is suspected. Perforated viscous can result from many processes. It is essential to consider other life threatening causes of abdominal pain when evaluating patients who are ill appearing with an acute abdomen. Early presentation of many of the causes of acute abdomen can be similar and difficult to distinguish. Do not exclude the possibility of abdominal aortic aneurysm, gastrointestinal bleeding, pancreatitis, bowel obstruction, volvulus in any form, mesenteric ischemia, any intra-abdominal infection prior to rupture or perforation and incarcerated/strangulated hernia. It is also important to consider pelvic sources in female patients, namely gynecological infections and ruptured ectopic pregnancy. Ill patients in whom perforated viscous is suspected require rapid and aggressive treatment. Obtain large bore IV access and start IV fluid resuscitation with crystalloid fluids (normal saline or lactate ringers). Begin broad spectrum antibiotics. Do not limit your differential diagnoses for these patients prematurely. The initial stages of treatment and diagnostic evaluation for perforated viscous and other causes of life threatening abdominal pain overlap. This allows you to assess for them while simultaneously resuscitating your patient. Severe abdominal pain is the presenting complaint in patients with perforated viscous. The onset of pain is sudden and accompanied by rapidly worsening overall condition. The patient will frequently relate a prior abdominal pain history that is less severe due to the underlying cause of the perforation (gastrointestinal ulcer, appendicitis, diverticulitis, malignancy, prior surgery, etc). The perforation results in leakage of air, gastrointestinal contents, and bacterial toxins into the peritoneal cavity resulting in generalized inflammation and peritonitis. A systemic inflammatory response syndrome (SIRS) begins due to the gross abdominal contamination. Patients will present ill appearing with varying degrees of fever, tachycardia, tachypnea and hypotension to full blown septic shock. Patients suffering from perforated viscous have an ill to toxic appearance. Depending on time of presentation the physical exam of the abdomen may range from focal tenderness to a rigid acute abdomen. Early perforation usually shows focal tenderness near the site of the perforation. As the leakage continues, peritonitis ensues resulting in the generalized tenderness, rebound, voluntary/involuntary guarding and rigidity. Patients with diffuse peritonitis will prefer to remain immobile as any jarring of the abdomen including movement of the stretcher, walking, deep breathing/coughing, movement of lower extremities and heel thump results in intense pain and tenderness. The presentations of perforated viscous can be altered in patients with delayed presentation, immunocompromised state or who are elderly. In those patients in whom an intra-abdominal abscess has formed to contain the infection, for example as in perforated appendicitis, the history may stretch out several days and the physical demonstrates focalized tenderness and rebound. Immunocompromised and elderly patients often have an unimpressive exam or vital signs but pain out of proportion to physical exam. Thus, maintain a high level of suspicion in elderly and immunocompromised patients as their deceptively mild presentations are coupled with a higher baseline risk of developing perforation. Laboratory evaluation for patients with perforated viscous begins with standard tests for abdominal pain: complete blood count with differential, comprehensive metabolic panel, lipase, urinalysis and urine pregnancy test (when applicable). The focus of these tests is to obtain initial hemoglobin, hematocrit, platelet counts, leukocytosis/leukopenia and obtain liver and kidney function. Lipase can help to exclude severe pancreatitis as an alternative diagnosis. Lactic acid and venous blood gas are frequently ordered to help guide resuscitative efforts and to evaluate for mesenteric ischemia. Type & screen or type & cross, coagulation panels and EKG will frequently be needed both for evaluation of other differential diagnoses (namely trauma and AAA) and for future operative planning. 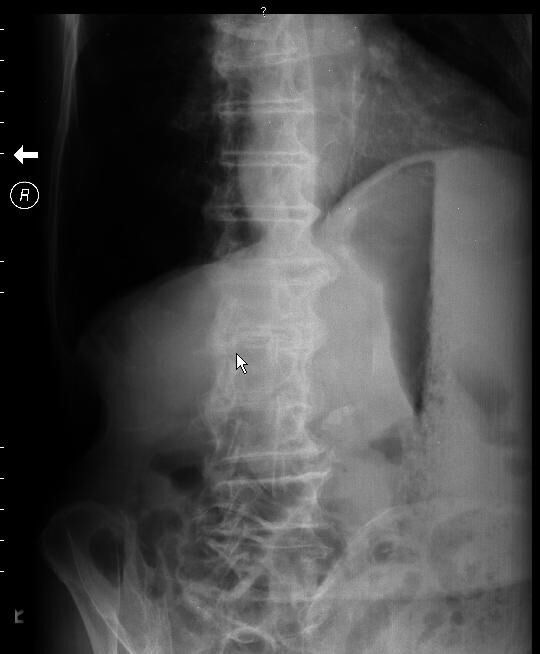 Choice of radiographic modality in suspected perforated viscous depends on the patient’s condition. It is important to understand that advantages and limitations of each of these modalities so that perforation is not prematurely excluded from your differential due to an unreliable image. Plain radiograph (upright and supine abdomen view + upright chest view OR lateral decubitus view) has the advantages of being performed rapidly and at the bedside. It can be obtained in unstable patients without moving them from ED while resuscitation is ongoing. However, radiograph for pneumoperitoneum is limited because it misses free air in a large portion of patients. The literature varies, however the most optimistic statistics for plain radiographs and pneumoperitoneum are as follows: 53% sensitivity, 78% specificity, 95% PPV, 20% NPV. Placing the patient in the upright or lateral decubitus views for 10 minutes before taking the image improves the likelihood of seeing free air. One study demonstrated that laparotomy proven perforated viscous had radiographs with free air only 50% of the time. Additionally they showed free air without actual perforation after exploratory surgery in 14% of cases. The absence of pneumoperitoneum on plain radiographs in patients suspected of having perforated viscous does NOT exclude the diagnosis and further evaluation is needed. CT abdomen/pelvis is the best radiographic assessment for free air. It detects even minute amounts of pneumoperitoneum. 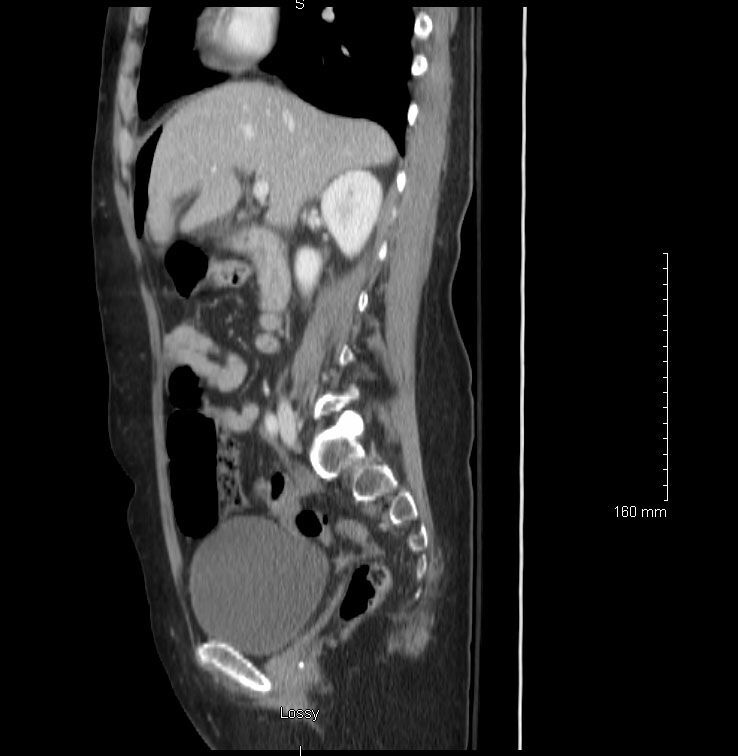 Additionally, CT scan can elucidate the source of the perforation including the retroperitoneum and demonstrates other causes of acute abdomen outside of perforated viscous. CT scan is limited as it takes longer (especially if oral contrast is used) and requires the patient to leave the ED. This modality will not be available to unstable patients who are refractory to resuscitative efforts. Ultrasound in the hands of the well trained provider is becoming more commonly used in the assessment of abdominal pain. It has been reliably used to assess for intra-abdominal fluid and abdominal aortic aneurysm which are potential causes of acute abdomen. Ultrasound can detect free air when utilized by an experienced and trained practitioner. Demonstration of a ring down artifact and enhancement of the peritoneal strip generates a 93% sensitivity of see free air with ultrasound in the RUQ view. The image below in the left from Blaivas et al shows enhancement of the peritoneal strip. The image below on the right from Jones et al shows the ring down artifact. Patients with perforated viscous are ill and require rapid intervention. These patients should be treated in the resuscitation or critical areas of the emergency department that allow for close monitoring and frequent reassessment. Continuous monitoring is required and treatment begins with managing basic ABCs. Oxygen supplementation to invasive airway management may be needed depending on the patients pre-existing conditions, severity of illness and work of breathing. Obtain TWO large bore IVs and start IV fluid resuscitation to help with normalization of vital signs and to restore adequate tissue perfusion. Resuscitation needs may range from a single liter of fluids to massive volume administration. Blood products may need needed in some cases. Treat pain aggressively but carefully consider your narcotic choices to avoid worsening hypotension. Begin antibiotics early in the workup. Anti-microbial coverage will depend on the site of the perforation. If the location of the perforation is unknown empirically cover for gram negatives, gram positives and anaerobes. Common empiric regimens for abdominal sources include: ciprofloxacin + metronidazole, piperacillin/tazobactam, or imipenem. Definitive management of perforated viscous requires general surgery intervention. Thus, early surgical consultation is warranted and in many cases initiated before the diagnosis is confirmed with imaging. The site of perforation must be identified and repaired and the gross abdominal contamination removed with large volume abdominal wash out. 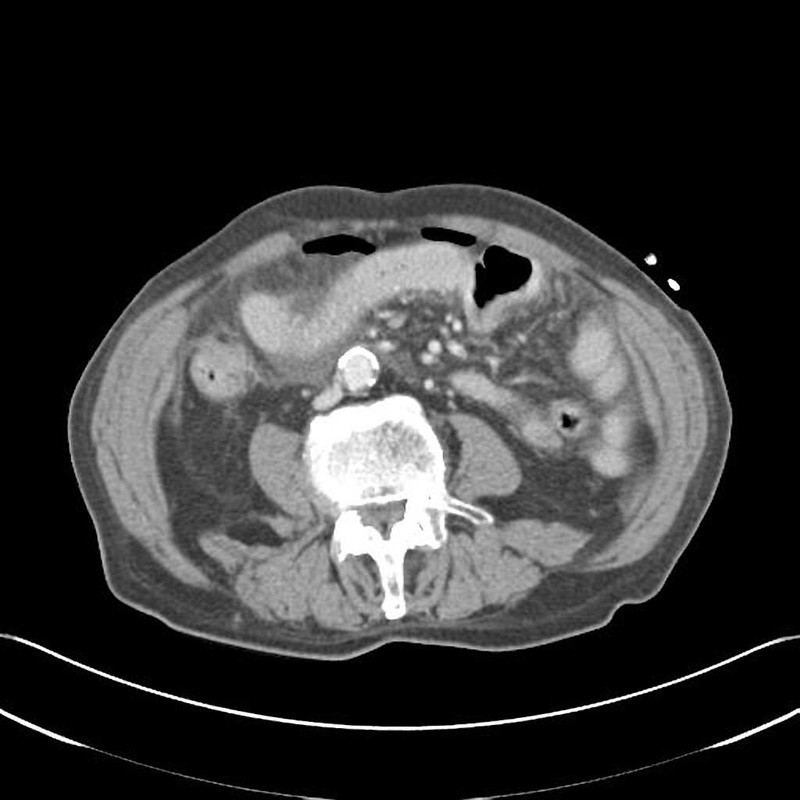 Some causes of perforation can be directly repaired, some will require omental or mesenteric patch and others can be contained with intra-abdominal drains from interventional radiology. The exact modality used will depend on the individual situation and will be determined by the surgeon. Begin aggressive resuscitation and antibiotics in patient suspected of perforation. Consult surgery early when perforation is suspected, even if confirmatory tests are not available. Do not rely on radiographs to rule in or rule out perforation. CT scan is the definite test for evaluation of perforation but cannot be attained in unstable patients. Langell JT, Mulvihill SJ. Gastrointestinal perforation and the acute abdomen. Med Clin North Am. 2008 May;92(3):599-625. Winek TG, Mosely HS, Grout G, et al. Pneumoperitoneum and its association with ruptured abdominal viscus. Arch Surg 1988;123:709–12. Roh JJ, Thompson JS, Harned RK, et al. Value of pneumoperitoneum in the diagnosis of visceral perforation. Am J Surg 1983;146(6):830–3. Woodring JH, Heiser MJ. Detection of pneumoperitoneum on chest radiographs: comparison of upright lateral and posteroanterior projections. AJR Am J Roentgenol. 1995 Jul;165(1):45–47. Williams N, Everson, NW. Radiological confirmation of intraperitoneal free gas. Ann R Coll Surg Engl. Jan 1997; 79(1): 8–12. Chiu YH, Chen JD, Tiu CM, Chou YH, Yen DH, Huang CI, Chang CY. Reappraisal of radiographic signs of pneumoperitoneum at emergency department. Am J Emerg Med. 2009 Mar; 27(3):320-7. Blaivas M, Kirkpatrick AW, Rodriguez-Galvez M, Ball CG. Sonographic depiction of intraperitoneal free air. J Trauma. 2009 Sep;67(3):675. Mularski RA, Sippel JM, Osborne ML. Pneumoperitoneum: a review of nonsurgical causes. Crit Care Med. 2000 Jul;28(7):2638-44. Review. Furukawa A, Sakoda M, Yamasaki M, Kono N, Tanaka T, Nitta N, Kanasaki S, Imoto K, Takahashi M, Murata K, et al. “Gastrointestinal tract perforation: CT diagnosis of presence, site, and cause.” Abdom Imaging. 2005 Sep-Oct; 30(5):524-34. Grassi R, Romano S, Pinto A, Romano L. “Gastro-duodenal perforations: conventional plain film, US and CT findings in 166 consecutive patients.” Eur J Radiol. 2004 Apr; 50(1):30-6.